There is nothing like a little controversy regarding animal abuse to taint a movie opening. As with most stuff you see on the Internet, one must not take anything at face value. If you like alternative facts, it will no doubt make some people think twice about going to see the movie. Check out this explanation from one of the producer Gavin Polone here. Director Lasse Hallström who also did Hachi: A Dog’s Tale knows his way around squeezing the heartstrings on the bonds of human and pet relationships. The screenplay by W. Bruce Cameron, Cathryn Michon, Audrey Wells, Maya Forbes, Wallace Wolodarsky, is based on the book A Dog's Purpose by W. Bruce Cameron. If you love dogs, you will enjoy this often cheesy but endearing tale. The story is told from the perspective of the dog (voiced by Josh Gad). The first mutt is literally short lived when it is caught by animal control. Before young kids can grasp what happened, the dog is reincarnated into a red Labrador Retriever saved by a young boy and his mom (Juliet Rylance) from dying of heat and thirst in a cab of a truck. The boy Ethan (Bryce Gheisar) names the puppy Bailey. They grow up together with the usual crazy carnage that comes with a high energy dog running around the house and chasing the cat. 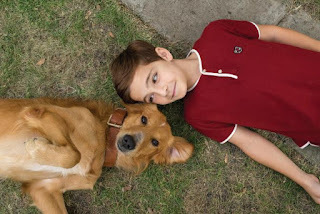 As a teen, (K. J. Apa) now is a football star and falls for Hannah (Britt Robertson) with the help of the clever dog. Tragedy strikes the happy couple, and Bailey becomes alone and depressed missing his human when he goes off the college. There are a couple more "lives" involving gender, name and breed changes as Bailey becomes a German Shepard canine cop and a chubby Corgy before becoming a Golden Retriever. His last owner kept him chained to a tree then dropped off in the middle of nowhere to fend for himself. His dog nose leads him back to the farm where he lived with Ethan (now Dennis Quaid). Of course he reunites Ethan with his old flame Hannah (now Peggy Lipton). It's a pretty cliche filled scenario that pulls on those sentimental emotions. Who can resist new born puppies? Who can resist those doggy eyed stares full of love and expectancy? The movie covers the issues of what animal control does to homeless dogs, leaving animals in hot cars, feeding pets nothing but human foods, neglect, and the dangers faced when working with police canine units. There's the expected moments of humor of dogs rolling in poop, playing with a donkey, doing stupid human/dog tricks and more heroic feats of saving people from a house fire, saving a girl from raging waters, saving his owner from being shot. All in a day's work for your typical movie dog. Humans are mostly secondary, as they only serve the purpose of adoring or abusing the pets while the dog narrator contemplates his fate and purpose for existence. There's a charm to this film that most dog owners will enjoy despite the corny machinations.